ASUS's first mixed reality headset has plenty of pleasant surprises: light, powerful and fun to use, it's well worth a look. Most of the technology inside is common across all of the manufacturers, but ASUS has worked hard to make its offering unique where it can. For example, it used a polygonal-art covering for the visor, ensuring that it looks much nicer than, say, Acer's View Master-esque offering. Similarly, ASUS's headset feels much lighter than its rivals' models, and the company included an antimicrobial cushion inside. Want to experience movies on ASUS Windows Mixed Reality Headset with perfect 3D visual effect? The following part will show you how to make this job completed. Nowadays, several sites allow you to rent movies by mail or stream them straight to your computer. Let's look at these websites that allow you to get 3D content. Do you still spend much money on 3D movies? Want more 3D video files? Here, you can save much money and energy, I recommend you the powerful 3D movie creator which can provide you the best 3D videos without much cost: Pavtube Video Converter Ultimate for Windows/ Mac. With this powerful 3D movie maker, you can not only make 3D movies from 3D Blu-ray, but also from 2D Blu-ray/DVD and various common files formats. The program helps to create 3D movies with the format of MP4, MKV, MOV, AVI, WMV with different 3D mode: Side by Side, Top and Bottom and Anglyph for viewing on 3D video players via ASUS Windows Mixed Reality Headset. When you get the 3D videos, you can also watch the 3D videos on any 3D TV, 3D projectors at will. Besides that, you can also do some 3D profile settings, you can adjust the 3D video depth value to get better 3D effect, switch left right image to change the displaying order for 3D SBS movies, or switch between "Red/Blue Anaglyph" or "Red/Green Anaglyph" for 3D Anaglyph videos, etc. according to your own needs. How to Create 3D Video for Viewing on ASUS Windows Mixed Reality Headset? 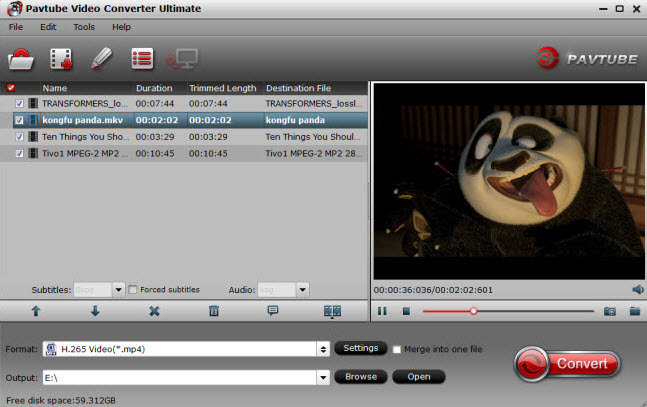 Launch the program on your computer, click "File" menu and select "Add Video/Audio" or "Add from folder" to import source video to the application. For loading Blu-ray or DVD disc, insert your Blu-ray/DVD disc into an external Blu-ray/DVD drive, click "File" > "Load from disc" option. Tap on "Format" bar and find "3D Video", there are a lot of options for you. "MP4 Side-by-Side 3D Video (*.mp4)" is recommended for ASUS Windows Mixed Reality Headset. 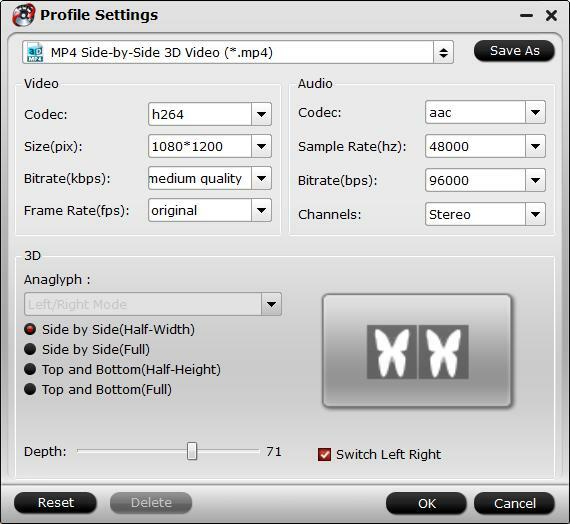 If necessary, you can click “Settings” to open “Profile Settings” window, here you can adjust output 3D video depth, select the specific 3D resolution: Side by Side (Half – Width) or Side by Side (Full) or change the image display order for 3D SBS movie. When you are not satisfied with the output 3D video effect, you can adjust the output 3D depth value to get better 3D depth perception. In addition, you can also use the “Switch Left Right” option to change the image display order for 3D SBS movie. Go back to the main interface and start the video/Blu-ray/DVD to ASUS Windows Mixed Reality Headset supported 3D video conversion process by hitting right-bottom "Convert" button. When the conversion is completed, click the "Open Output Folder" on the main interface to pop out the folder with generated 3D file formats. Then feel free to transfer and view them via ASUS Windows Mixed Reality Headset. Windows Mixed Reality is Microsoft's hottest investment of 2017, extending the traditional desktop experience to a fully-realized virtual world. With its official debut kicking off this fall, a wide range of third-party hardware partners are already investing in the platform, with headsets from Acer, ASUS, Dell, HP, Lenovo, and Samsung. Let's take a closer look at what expect from each of these devices. Acer WMR headset: 1440 x 1440 per eye (2880 x 1440 combined), LCD, 90Hz. ASUS HC102: 2880 x 1440 single display, LCD, 90Hz. Dell Visor: 1440 x 1440 per eye (2880 x 1440 combined), LCD, 90Hz. HP WMR headset: 1440 x 1440 per eye (2880 x 1440 combined), LCD, 90Hz. Lenovo Explorer: 1440 x 1440 per eye (2880 x 1440 combined), LCD, 90Hz. Samsung Odyssey: 1440 x 1600 per eye (2880 x 1600 combined), AMOLED, 90Hz. Acer WMR headset: 95 degrees. HP WMR headset: 95 degrees. Tracking In its current implementation, all Windows Mixed Reality headsets allow for six degrees of freedom, which allows the user to move in all directions and orientations within a three-dimensional space. These headsets also adopt "inside-out tracking," which allows positioning to be calculated internally, without the need for additional external sensors. Acer WMR headset: Accelerometer, gyroscope, magnetometer, and proximity sensor. ASUS HC102: Accelerometer, gyroscope, magnetometer, and proximity sensor. Dell Visor: Accelerometer, gyroscope, and magnetometer. HP WMR headset: Accelerometer, gyroscope, and proximity sensor. Lenovo Explorer: Accelerometer, gyroscope, magnetometer, and proximity sensor. Samsung Odyssey: Accelerometer, gyroscope, magnetometer, proximity sensor, and IPD sensor. Acer WMR headset: 3.5mm combo jack. ASUS HC102: 3.5mm combo jack. Dell Visor: 3.5mm combo jack. HP WMR headset: 3.5mm combo jack. Lenovo Explorer: 3.5mm combo jack. Samsung Odyssey: Integrated AKG headphones, in-built microphone array. Ports A hard-wired connection to a Windows 10 PC is a requirement for all Windows Mixed Reality headsets launching this fall. Right now, all headsets adopt an HDMI 2.0 port for transmitting a low-latency video signal, whereas a USB 3.0 connection is used for other data, including tracking information. Both of these cables are four meters long out of the box, which allows for a fair amount of movement in almost any Mixed Reality setup. Acer WMR headset: 195.8 mm (W) x 94.8 mm (L) x 106.59 mm (H). Dell Visor: 210 mm (W) x 330 mm (L). HP WMR headset: 338.84 mm (W) x 176.02 mm (L) x 127.76 mm (H). Lenovo Explorer: 185.1 mm (W) x 94.8 mm (L) x 102.1 mm (H). Samsung Odyssey: 202 mm (W) x 131.5 mm (L) x 111 mm (H). Acer WMR headset: 350 grams. ASUS HC102: "Under" 400 grams. HP WMR headset: 834 grams. Acer WMR headset: October 17, 2017. Dell Visor: October 17, 2017. HP WMR headset: October 17, 2017. Lenovo Explorer: October 17, 2017. Samsung Odyssey: November 6, 2017. Acer WMR headset: $299 standalone, $399 with controllers. HP WMR headset: $329 standlone, $449 with controllers. Lenovo Explorer: $349 standalone, $399 with controllers. Dell Visor: $349 standalone, $449 with controllers. Samsung Odyssey: $499 with controllers.